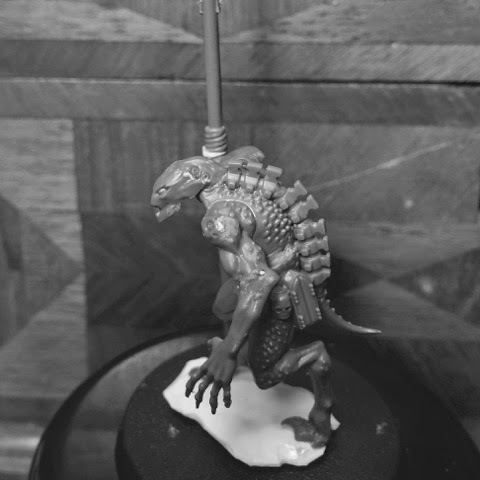 Finally some long avaited bitz arrived in the mail which helped me move forward with xenos no.2. Inspired loosely by John's sanctioned xenos sketch (shown in the first invitational post and which in turn I feel is at least somewhat inspired by the Predator) this guys working name has become "the Hunter". Here's where he's at at the moment. The spear tip is deliberately not in the picture as I haven't finished the design of the business end of the weapon. Love this one, my first thought was 'codex fishmen' ! my only suggestion being that he could do with a couple of techy bits and bobs on his person. He´s got a few in his belt that´s not very visible. Plus the cybernetic spine of course. Also I`ll probably add a shouldermounted weapon predator style. I've done a Predator's inspired hunter a year ago.... It's on the first page of my AB plog... We both got the same base with the bloodletter body.... Anycase, nice work mate! Checked it out - very cool! Nice rifle! I imagine him as some sort of bounty hunter chameleon, kinda like the guy out of Monsters. Inc but badass and grimdarky and scary. 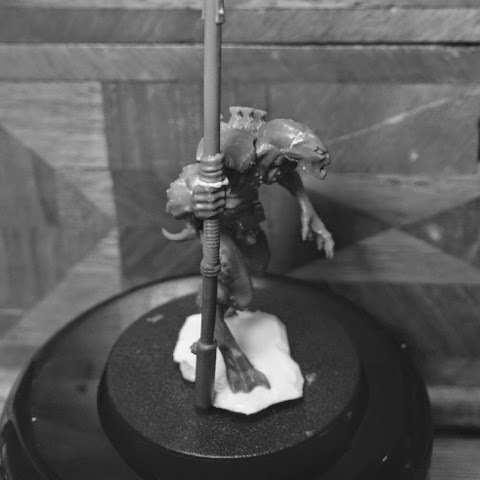 A chameleon colour scheme would look pretty cool i think, was there any specific way you wanted to paint him? some kroot bits would look cool i think on this by the way. I think I'm going to stick to a fairly earty predatoresque paintscheme. Or possibly dark grey as he has something of a panther about him. The predatoresque style will look awesome i think, you thought about adding some poor soul's decapitated head or something as a trophy? like him holding it or something, hell, if its just on the base then it will look cool too. He also reminds me of the monster out of a movie over here in England called attack the block. He looks well, man! The pose is great. Very imposing. It's all in all a very striking character and it leapt of the screen the moment I saw my feed. That dryad head gives a nice androgynous feel to the model. It took me a second look to realise the spine was an addition. I'd originally blanked over its part off the stock model. It's obvious now I've realised. The head seems a tad small in my eyes but that could just be the angle of the shots being deceptive. Have you thought about adding a crest or something else to the head a la kroot or were you going to leave it smooth and bare. There will be something. More spine or wires or possibly a mane or crest. We will see. Those bloodletter torsos are almost made to have a cyberspine added :) I have an Inq servitor built in roughly the same way. Yeah - it's a really easy conversion. The necron spine fits perfectly into the grove on the back. 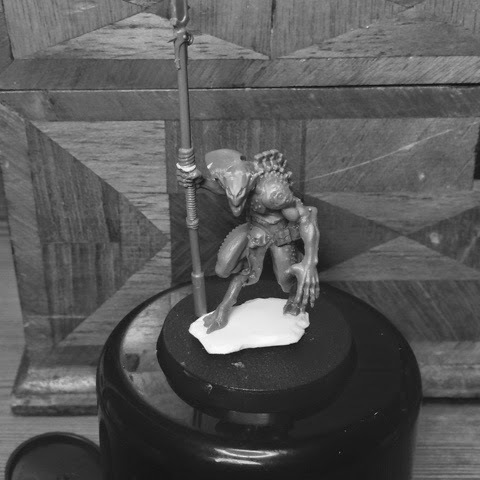 The Hunter is a brilliant conversion Jeff! Really inspiring - and a great way to use the wonderful Dryad heads. Thank you for the inspiration!